The Death Company squad for the commission army that I am painting is nearly done. All that is left is a few detail pieces and another wash for the metal. These models are really nice- full of detail and capture the spirit of the Blood Angles very well. 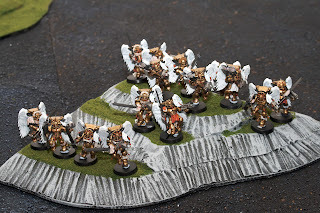 In fact, I like these models much more than the Sanguinary Guard, who lack a lot of detail on the those models. There is a lot of plain gold on those models, which is just a pain. Gabe..you need to clean up your Diorama..they all appear to have gum on their shoes.. :P Excellent work man! I envy your ability to paint smooth white. Looking very good, Dr.G... but after this will you ever be willing to paint gold again? I really like how the Death Company guys are turning out, too. 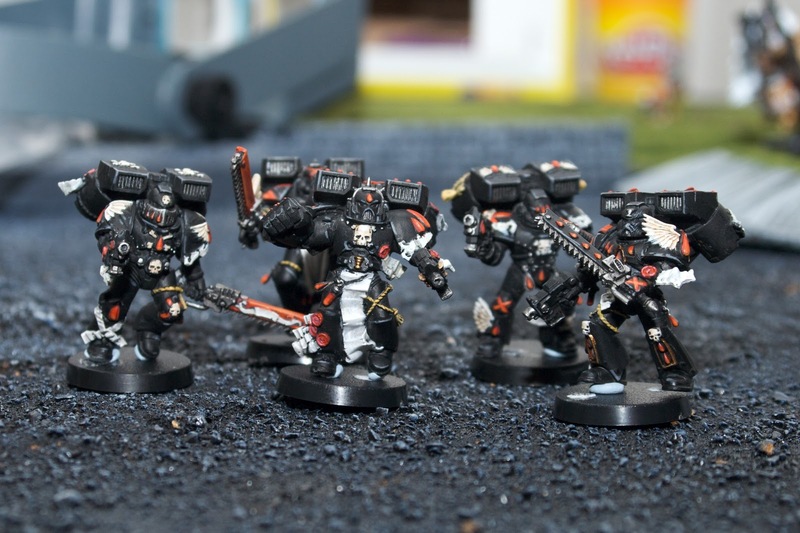 How much is left for you to paint once you've finished them and the Sanguinary and Honor guards? Hexeter- white has become kinda easy. I started with a grey foundation paint and then several layers of white. Just move in the same direction with every brush stroke, and do it a lot! Foundation paint is the key to painting white over black. JJ- Thanks, but I don't think I'll ever paint an army that wants a total metal paint scheme again (I am looking at you Necrons!). 10 Troops plus two characters and one tank. So almost done! Only 5 of those models are solid gold.